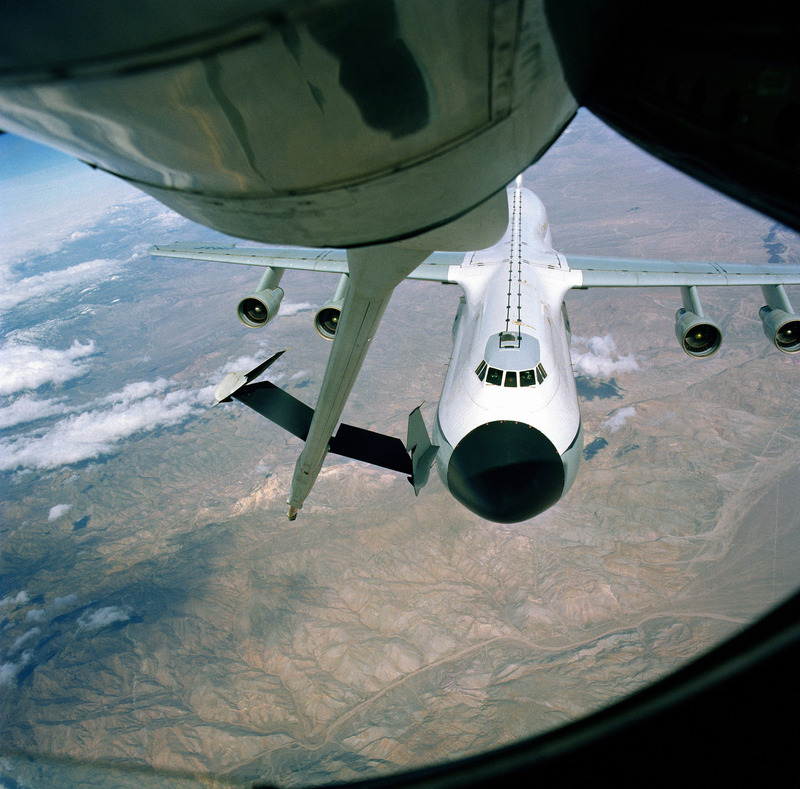 Hi I was a boom operator in the late 70’s & I love pics of air-refueling. I would like to see more of your pics. You said you have over a 1000; where can I go on you web site to see them. I have 2 boys (9& 10) that would love to see more. I am looking for a picture of a 46th ARS (K.I.Sawyer) 135 with the rainbow flash on the tail. Any help would be appreciated. I was a KC-135 pilot during 1971-1975, stationed at Seymour Johnson AFB, NC. I flew 98 combat missions in SEA, most of them out of Utapao and Kadena. I was looking for information on a crash involving one of our crews from SFAFB that occurred at Torrejon in 1974, but I don’t see it on your list. The craft landed short of the runway and all aboard perished. I have some black and white polaroids that my uncle took from his F-84G of them refueling as a squadron. He was stationed at Turner AFB in Georgia and I was told that he was a member of the Fox Able One mission. I was told that this was the first squadron to fly the Atlantic while refueling. Can you confirm this and would you be interested in copies of the pics for the site? If it isn’t too much work to scan them, then I wouldn’t mind. I think that it would make a nice addition to the site. I would be interested in seeing the photos Wally. I believe that my second cousin was the Squadron Commander during this deployment. I just activated my registration with Airrefueling and saw your comment, I’d be interested to know what information you might have on this mission. I have tried US Airforce History and I get no response. My uncle flew a F-84G – it had an arrow down the side of the aircraft. I’ll dig up the info and get it out. The info I have is just family stories. I will have to do some more research to see what I can find. His name was BG Thayer Stevens Olds. I just got the following “General Olds became a jet pilot at the age of 46, and in August 1953 led 20 F-84 Thunderjets of the 508th Strategic Fighter Wing from Turner Air Force Base to England in an historic non-stop flight which was accomplished by the use of air-to-air refueling.” From the official Air Force biography of General Olds. He was commander of the 40th Air Division at Turner AFB at the time. I have my Uncle’s Air Force file I’ll have to look at it and the dates. I know that he was at Turner about that time. due to the large number of people killed at the crash site. I was a Boeing engineer starting in 1950, i worked on the KC97 development. I was in a car pool with some of the engineers working on the boom development for the KB-29P . I am interested in finding more about the very early development of the boom. Some of the patents are in Clifford Leisy’s name (no relation) but I am curious of the real early days of original development at Boeing. Very interesting. I did a Google Patent search for Clifford Leisy and it comes up with a lot of very interesting patents! I’m so glad I stumbled upon this website. Thank you for putting the time and dedication into capturing such an amazing piece of our military history! I’ll send you some pictures as soon as I filter through what I have. I spent some time on the KC-135 and am now a KC-10 boom. With any luck I’ll get to fly on the KC-46 too. I have photographs that my uncle took from the cockpit of his F-84G during Operation Longstride. He flew out of Turner Air Force, Albany Georgia. Rusty, I would be interested in seeing the F-84G photos as my second cousin, BG Thayer Olds was the leader of the second flight of F-84s in the Operation Longstride mission. John, I’ll be glad to make copies for you, if you like. It might take a bit of time, I’ll have to pull them out of their frames. The two are very nice sequential photographs: one shot has a F-84G drinking from the tanker with FS-252 waiting for her turn and my uncle next in line, taking the photo. The second shot shows the first F-84G banking away with FS-252 getting refueled and my uncle, FS-249, waiting his turn. If you care to send your address, I’m at rbkehl1776@aol.com. Hi Rusty, I just came upon your site while reminiscing about my days as a boom operator on the KC-135A. I thought I would share a story about your picture of the Boom Operator memorial. If one looks closely, on the entry of Jan ’89 you will see the name Capt. Robert Llewellyn. Although it seems out of place for a commissioned officer to be listed in a tribute to enlisted position, he is listed because before becoming a KC-135 pilot, “Dusty” Llewellyn was a KC-135 boom operator. He and the other boomer listed, SSgt David “Wolf” Vickers were lost in a tragic crash out of Dyess AFB, along with 3 other crewmembers and 12 passengers. The two were squadron mates and friends of mine at K.I. Sawyer AFB, where that flight had originated. I’m not sure if you have heard this story before, but if not, I hope it is helpful. Why is it that KC-135A, 61-0273 is not listed? That was the tanker that crashed as a result of a mid-air over Palomares, Spain, with a B-52G, T/N# 58-0256. This resulted in the loss of 4 nukes, later recovered 2 whole and two which ruptured spilling their radioactive material on Spanish soil. The crew on the tanker were: Major Emil T. Chapla (dead,) Capt. Paul R. Lane (missing,) Capt. Leo M. Simmons (missing) and MSgt. Lloyd C. Potoliccio (dead.) While MSgt. Potoliccio, is listed on the memorial, the only aircraft on the KC’s that crashed on 17 Jan 1966, is one from Amarillo, TX., T/N#57-1424. How did an event that was news around the world get left off the listing of destroyed tankers? I know it was news, as I was the Minot AFB, newspaper editor at the time. That was before I became a ‘135 boomer. Hi Rusty, Long-term follower of your excellent work; please keep it up. I have used some of your pictures for training and presentations and would love to see more of them. I am a former RAF VC10 tanker/receiver pilot, had the honor of serving 4 years as a KC-10 IP/EP on a NATO exchange at Travis, I spent a further 4 years in the RAAF on the KC-30A project, then a year at Airbus on the A330 MRTT project and I’m now in the UAE, as an IP/EP on the A330 MRTT. I do enjoy a spot of Air refueling! Cheers. This comment is with reference to a question on the website about Boeing 747 tankers. I was a KC-135A navigator at Pease AFB, NH from January 1976 until March 1979. My very first alert was at one our satelite alert locations, specifically McGuire AFB NJ. During the one week alert tour two brand new Iranian 747 tankers made an overnight stop for crew rest and fuel at McGuire prior to continuing on to Iran, and they parked near our alert facility. Prior to their departure, our crew got a tour of one of these brand new 747 tankers. Beautiful aircraft. Months later the AF chose the KC-10 for their new tanker, which coincidently was just several months after the American DC-10 crash in Chicago. The consensus of opinion among tanker crews at the time was that McDonnel Douglas got the KC-10 contract to keep the company afloat after the accident. Hi, I’m one of those left behind, a Tanker Nav, that started my career as a KC-97L assistant crew chief and ended my career just short of the end of reliable tanker navigation. I love your site. I knew several KC-135 A/E crew that have gone west in the line of duty. I cannot thank the webmaster enough for creating this.